Mold Max™ Series - Smooth-On's new line of tin-cure silicones that feature low mixed viscosities with high tear strength and knotty tear propagation. Currently available in 10A, 20A, 30A and 40A Shore Hardnesses. 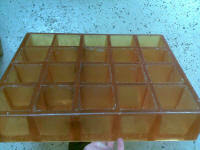 New Mold Max 15T & 27T are translucent and allow you to see your model. Thi-Vex™ thickener will thicken Mold Max™ Silicones (except Mold Max 40) to a brush-on consistency for vertical surface application. FastCat™ catalysts will reduce demold time to a few hours. Mold Max™ Thinner will reduce mixed viscosity for easier degassing and pouring. and display applications. Two liquids are mixed together and poured into a container. The mixture cures overnight to a solid water clear rubber that can then be easily broken or “crumbled” into pieces that look exactly like broken glass, ice or diamonds. Erapol CCM95A is a medium performance cold castable polyurethane elastomer. This product offers good toughness, high elongation, tear strength and abrasion resistance. It can be readily processed and cured at room or elevated temperatures. The convenient mix ratio and low viscosity allow for easy mixing. Great for concrete molds and stamps, cast in place liners and sound dampening. Erapol CCM75A is a medium performance cold castable polyurethane elastomeric. This product offers good toughness, high elongation, tear strength and abrasion resistance. It can be readily processed and cured at room or elevated temperatures. The convenient mix ratio and low viscosity allow for easy mixing. Great for concrete molds and stamps, cast in place liners, sound dampening and casters. Erapol CCM55A This product offers good toughness, high elongation, tear strength and abrasion resistance. It can be readily processed and cured at room or elevated temperatures. The convenient mix ratio and low viscosity allow for easy mixing. Great for concrete molds and stamps, cast in place liners and sound dampening. Brush-On™ 40 - a softer version of our popular Brush-On 50 with an ultimate shore hardness of 40A. Brush-On™ 40 is more pliable and flexible than BO 50 but still offers excellent abrasion resistance and high tear strength. It has the convenience of a one-to-one mix ratio and is easy to mix and apply with a brush or spatula. Brush-On™ 40 paints onto vertical surfaces and will cure with negligible shrinkage to a durable rubber that performs and lasts in production. Brush-On™ 40 is compatible with BO 50. You can apply 2 layers of BO 40 and back it up with 2 layers of BO 50. Brush-On™ 40 is suitable for production casting of wax, concrete, hard plasters and other materials. It is used for architectural restoration, reproducing sculpture and many other applications. Brush-On™ 50 & 60 - developed to offer superior tear strength and abrasion resistance. They offer a convenient one-to-one mix ratio by volume and give the user ample working time to apply the material - in the studio or right on the work site. With a creamy consistency, Brush-On™ 50 & 60 paint on easily to vertical surfaces. They will cure with negligible shrinkage to a durable rubber and will stand up to repeated casting of abrasive materials like concrete. Brush-On 35 - a softer, more flexible version for fragile/intricate detail work. properties compared to our popular Smooth-Cast line of general purpose casting resins. Shell Shock™ FAST and Shell Shock™ SLOW are thixotropic plastics that self thicken when mixed and can be brushed onto a variety of surfaces or into rubber molds. When Parts A and B are mixed in proper proportion, material cures at room temperature with virtually no shrinkage to a hard, durable plastic that exhibits good compressive and flexural strength. Fully cured castings are rigid and can be sanded, primed and painted. Color effects are possible by adding SO-Strong Color Tints. SMASH! Plastic is a new urethane liquid plastic designed to shatter/crumble on impact (“breakaway glass"). SMASH! is water clear and, once fully cured, shatters like glass. It can be cast solid in thin sections to make window panes or rotationally cast to form hollow bottles, jars or other glass-like objects to be used as breakable props for movie and stage productions. Salease is a low viscosity liquid mold release agent based on heavy duty silicones. It gives excellent release characteristics for simple and complex casting and molding operations. Universal Mold Release Agent is formulated especially for mold making and casting, and works well with most liquid rubber and liquid plastic products. It will release mold rubbers (such as polyurethanes and polysulfide's) from properly prepared models. aluminum, chrome, RTV silicone, epoxy, rubber, and steel molds. castings from Smooth-On rubber molds. We carry a large range of casting products from both ERA Polymers and Smooth-On. If you are unsure of which product is suitable for your application, whether it's casting concrete paving, breakable glass for windows in a movie or a intricate jewelry piece, we have or can get something that will suit you. Below is just a sample from both the ERA & Smooth-On range. 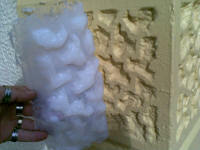 Using Smooth-On Dragon Skin Silicone to make a copy of a old style building quoin. Smooth-On Brush-On 40 being used to make a glove mold. 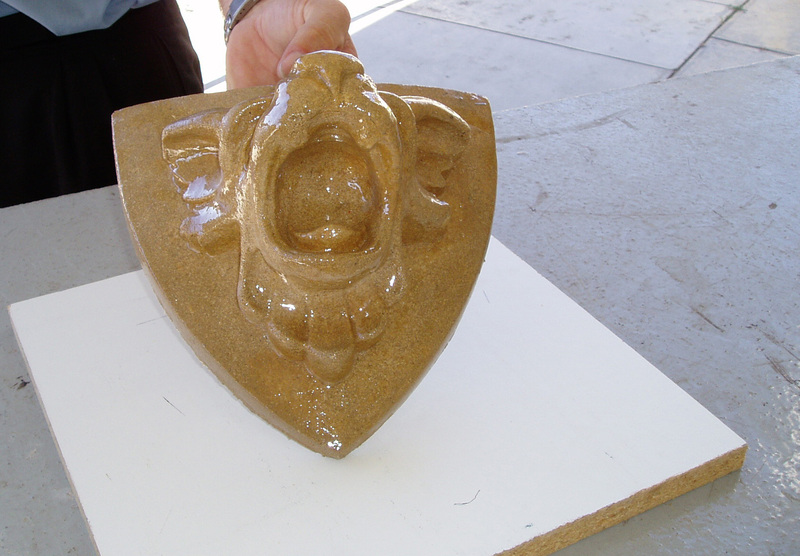 Erapol CCM95A was used to make this mold for pre-cast concrete separators. Smooth-On Smooth Cast 326 with So-Strong tint and Glow in the Dark pigments.